Being up by 10 points (a TD) would have won the game. Being up by 3 (an interception) would have given the Giants a 0.79 WP. Being up by 6 (a FG) would have given the Giants a 0.82 WP. In this situation, a FG does not help very much. This compares favorably to the 0.82 WP for kicking the FG, but not by much. Putting this in perspective, Coughlin's decision to run instead of pass on 3rd down cost 0.01 WP. His decision to kick the FG cost 0.05 WP. But his defense's inability to stop the Chargers' TD drive cost 0.84 WP. This one really is on the players. In Philadelphia, the Eagles were down by 7 with 4 minutes remaining and faced a 4th and 11 on the Cowboys' 34-yard line. Reid opted for the long FG attempt, which was successful, making it a 4-point game. The Eagles still needed a TD to win. Going for the conversion isn't as unlikely as many would think, about 28% of the time. Still, kicking the FG wasn't a terrible decision. I'll spare everyone the math, but it's about a break-even decision. The Eagles had no timeouts remaining, so a single 1st down conversion by the Cowboys seals the game. Sure enough, that's exactly what happened, and the Eagles never saw the ball again. What Reid should have done is followed the FG with an onside kick. Chances were very good they wouldn't get the ball back, particularly because the Cowboys are one of the league's top running teams this year. You don't even need to do the math. To win the game Reid had to assume his defense would force a 3-and-out, so an unsuccessful onside kick wouldn't really hurt that much. 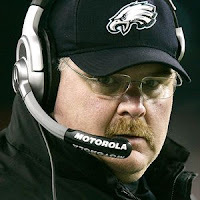 A successful onside kick would give the Eagles all kinds of time and decent field position too. That's the recovery rate when the receiving team fully expects the onside kick, and that's not necessarily the case with 4 minutes left in the game. If I were Reid (in hindsight), I would have considered an onside kick from a conventional formation. I'll point out that while the Coughlin decision to run/pass may not have been that decisive, he faced two other 4th and 1 decisions in the game that were, I suspect, quite costly from a WP perspective. I may have the specific yard markers wrong or other details since I am going from memory, but . . .
4th and 1 from the SD 28, first drive of the game, he went for the FG. The hold was botched and no kick occurred. 4th and 1 from about the SD 45, third quarter. Punt. Fair catch interference against Sproles resulted in about a 15 yard net punt. I know that the specific outcomes of those plays were bad for the Giants, but here's the thing--kicks and punts aren't perfect. Bad things do happen, a lot more than coaches apparently think. I suspect when you add up all the decision making in this game, Coughlin contributed his share of WP to the loss. On the Reid call, does your estimate consider the fact that he had no timeouts left when you are looking at score/time situation? I thought it was a roughly even call at the time too. The announcers were questioning why you would kick a field goal when you still need a touchdown. Hello! A touchdown wins in one scenario, and just ties in the other, thus you avoid overtime. I personally would have gone for it, given the lack of timeouts, but I understand why a field goal wasn't a horrible decision there. The Giants would have been better off if they didn't make the FG and kept the lead at three. By going up by 6 points they forced SD into going for the TD, and we all know what happened. Had they been up by only three SD likely would have played the last drive differently by playing for field position, the tie, and overtime. Brian- did Reid make the correct decision in going for the field goal in the first place? Obviously he made it, but how likely was that and what would you be saying now if it missed? buzmeg- Although I think that may be true against most teams, I don't think that applies to the Chargers. Especially with Philip Rivers - I think he would go for the win. Remember, this is the same team that went for a touchdown in OT last year in the playoffs. Thank you for doing this. I saw the NYTimes article this morning and had a feeling you would weigh in on this subject. I have to admit I'm really surprised by the Eagles result. I thought Reid was making a big mistake there. Can you show us the math? I know its difficult for some, but I think most of us love the math. Thats one of the main reasons were here. I guess I'm really surprised by the 18% following deep kickoff number. That number is the product of the possibility of 3-out and driving the ball 70 yards for a TD with no timeouts and 2 minutes on the clock. You have the probability of winning after a successful onside kick as 29%. I have to assume the probability of winning after a 3-out/punt is significantly lower because its about 20 extra yards and 2 minutes less. Lets assume its around 25%. That would imply the possibility of a 3-out is 72% (18/25). That seems really high. 3-outs occur on 31% of all drives. Of course this situation isn't "all drives". Its basically a guarantee that Dallas won't be throwing deep here, so Philly can cheat its secondary up. On the other hand, I would think the lack of incomplete passes from 3 straight run/screen passes would result in a lower 3-out possibility. I'm also curious about the probability for success after 4th down conversion you used. A fourth down conversion would succeed 28% of the time. A 52 yard field goal would be successful roughly 50% of the time. I'm going to assume that the probability of winning after failure on either was 9%. 18%/2 seems logical to me. The Cowboys have the ball on roughly the same point on the field. The Eagles have the same plan....force a 3-out and score a last minute TD. Its just in this case, the TD ties, so cut the probability in half for winning in OT. So that means you have the probability of winning after a successful 4th down play as 25%. Actually, I guess that sounds about right. They would need to score...stop Dallas on the ensuing possession and win in OT. I guess 25% is right for that situation. Still, I think that calls more attention to the 18% figure. Its hard for me to imagine that the WP of having the ball 1-10 22 yards away from the tying score is only 7 percent higher than the WP of having to get both a 3-out and a 70 yard no time left TD drive. Sorry to question the math. If these are the figures, these are the figures. I trust your numbers. I guess one of the biggest transitions between casual fan and sabermetric analyst is accepting that some percentages aren't quite what you think they are. It seems to me that the Giants kicking a field goal in that situation is an extremely poor decision that should have had more than a little influence on the results. If the Giants fail to convert, the Chargers are pinned inside the 5. The Chargers probably go for the tie, which would mean a 50/50 overtime. They would have to make the field goal, if they miss, the Giants win. If the Chargers go for the touchdown instead, and succeed, it is no different than if the Giants kicked the field goal instead. And they deserve credit for making the right choice. In a conservative NFL, its probably better to give the other team a chance to make a conservative choice instead of forcing them to go for the win. If the Giants succeed, the Chargers need a touchdown and a field goal with less time on the clock. And of course, they would need to get the onside kick. I'm assuming the odds of that are really low. One other thing occurs to me. If the Chargers are pinned near their own end zone, the Giants could get a safety to win the game. This seems like a possibility if Rivers has to pass from the end zone. He might also have to get rid of the ball quicker, because of how risky a sack is. Or, they might try to run the ball out of there, burning more time on the clock. 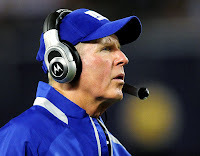 Regarding the Giants-Chargers game, it is fairly obvious that the Giants should have gone for it on all 3 4th downs, but last was the most obvious, even for a conservative coach like Coughlin. Ignoring the statistics, I struggle to see how adding 3 points in that situation does anything good. If he was expecting the defense to stop a TD drive of 70-80 yards, he should have counted on them to stop a FG drive of 60-70 yards if the 4th down conversion was unsuccessful. If they didn't, the Giants still have a 50/50 chance in OT. Turner wouldn't have played for a win in this case since his team would have had to go 95 yards for a TD. The only thing I can think of from a pyschological viewpoint is that by adding the 3 points, Coughlin was taking the tie "off the table" and forcing it to be a win/lose situation. But if we go down that road, why not be macho and go for it on 4th & 4 from the 4 and hope to put the game away? Coughlin's conservative nature has put his teams in a position to win many times in the past, but this is one where his conservatism had as much impact on the game as the play of his team. Okay you could say it is the wrong decision to go for it but at least make them drive from the two (say) rather than the 25 because they will only take the tying FGA if there is no chance of the TD and any Offense WILL BE THINKING TD TO WIN IN THE FIRST INSTANCE; NOT FORCING OT ! Hmm.. that WP(up 6)= .82 and WP(up 3) = .79 seems too small of a gap. It's saying they (Cards) score a TD drive to win 18% of the time - that seems right. But there has to be at least another 20% of the time on top of the 18% where a FG ties the game - and assume that overtime is a 50/50 chance, that would add another 10% to the 79%. IDK, I know the data must say differently but the gap there between Up 6 and Up 3 seems too small. We talked a lot about this in the thread on Jim Zorn. Look there and you will see a lot of the details. The bottom line is that missing a 4th down conversion leaves them significantly farther away from FG range than they would be after a kickoff. The extra yards mean they have to drive almost as far for a FG as you have to drive for a TD. Also, remember the 18% for a TD is when you don't have the option for a FG. When they do have the option for a FG, they kick it even if they would have gotten a TD if they keep on going. In other words, you can't assume that they score the game winning TD in regulation 18% of the time down 3. That number is considerably lower as teams settle for FGs in that situation. Very interesting discussion; I will not quibble on the math. The major point is to transition from the general, e.g., the WP is 0.75, to the specific, the head coach to decide what play do I call in this situation? I agree with Reid's decision to go for the field goal, even though it was a long kick, because the chances of success for the kick are much higher than making a first down with 4 and 11. If he doesn't make the first down, the game is over. Bottom line: delay the final decision as long as possible. But Reid should have then gone for the onside kick. The chance of gaining control of the football greatly outweighs the loss of some 30 yards or so, the difference between the field position for the onside and for a normal kickoff return. Hi all...I just discovered this site after a bit of googling following a debate with some of my friends on the Reid decision. As a long-time baseball sabrmetrician I'm very familiar with the concepts expressed here, but I'd be very grateful if the author could actually post the math he's using to get to his conclusion. I can believe it, but I'd like to actually see the numbers broken down rather than just the final conclusion that it was "about break-even". Thanks! "I agree with Reid's decision to go for the FG, even though it was a long kick, because the chances of success for the kick are much higher than making a first down with 4 and 11. If he doesn't make the first down, the game is over." How is the game over if they fail to make the first down? If they fail, the result is that Dallas gets the ball back between the 23 and 33 yard line with a 7 point lead. The actual result was that Dallas got the ball back at their 23 with a 4 point lead. What's the difference? I'd really like to see a WP analysis of the FG decision. I will third the request to see the math on the Andy Reid FG attempt. Ok. I can't ignore 3 requests!